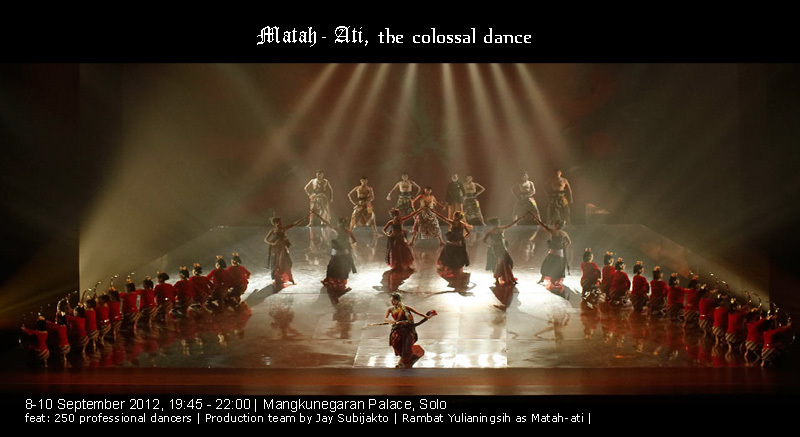 A colossal dance event called: "Matah-Ati" will be perform in the center of Solo City, at Mangkunegaran Palace. Matah-Ati (translated as: to broke a heart), also alias name of R.M Said's wife Rubiyah, one of Indonesian heroes in Java Kingdom, is an hour and half long performance of dance, with a total of 17 scenes. After a successful royal-grande exhibition in Esplanade Theater, Singapore, this involved 250 professional artists (all choreographers and dancers are professionals in the field of arts with undergraduate, graduate, and even Phd) including Indonesian's best creative production team Jay Subijakto, will continue their journey to demonstrate some epic of Indonesian cultural grande history. One of Matah-Ati dancer is Rambat Yulianingsih, who played Rubiyah, one of the central figure in the show, who got a guidance from Eyang Tarwo and Ibu Umi, two great Mangkunegaran dance instructors. She had already mastered all the palace dance masterpiece like Bedaya Angilir Mendung, Srimpi Moncar, and Gambyong Retno Kusumo. Source from matah-ati.com, thejakartapost.com and several related news. See you in Solo! Including return economy class ticket by garuda Indonesia, 3 days 2 night stay in Best Western, pickup from Adi Soemarmo intl Airport to Hotel. call: 021-2305151.